EcoSikh organised two movie screenings in Malaysia in the month of June. The movie named " A Little Gardener" was screened at Wadda Gurdwara Sahib Jalan Kampung Pandan, Kuala Lumpur and Wadda Gurdwara Sahib Penanag followed by a discussion session by EcoSikh team with the sangat at Gurdwara. EcoSikh Rajasthan team celebrated World Environment Day by organizing a drawing competition based on nature for kids. A very innovative and fun way to teach kids the importance of nature in our life. Sikhs along with seven other faiths at the international meeting Faith in Finance in Zug, Switzerland, focused on impact investing and finance! 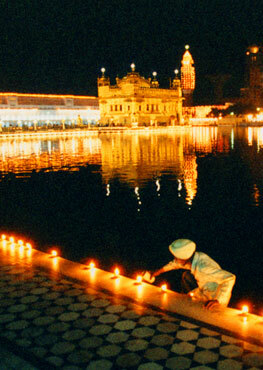 8 religions were represented along with major financial institutions and Investment groups and the United Nations. EcoSikh represented the Sikh faith in the discussions and deliberations and also presented the Sikh perspective on faith consistent investment and finance. Dr. Rajwant Singh took part in this meeting on behalf of Sikhs. On the occasion of Shahidi purab of Guru Arjan Dev Ji, EcoSikh Nabha team is organising a Green Nagar Kirtan on 16th June, 2018 conducted by Gurdwara Sahib Kartarpura Mohalla, Nabha. A unique way to know and learn about nature around you. EcoSikh Mumbai team took part in the RunForTheOceans campaign and cleaned up the Versova beach in Mumbai that was overfilled with the plastic and styrofoam garbage. Rajasthan Patrika praised EcoSikh and its work in their publication. Hundreds of community members came to support EcoSikh at the 6th annual fundraising gala event on Sunday, June 10 at Gaithersburg Hilton in Maryland, USA. Many were moved by the critical work being by the EcoSikh volunteers in Punjab and other parts of the world to save the environment. EcoSikh team thanks you all for participating in Volunteer Induction and plantation training camp today. 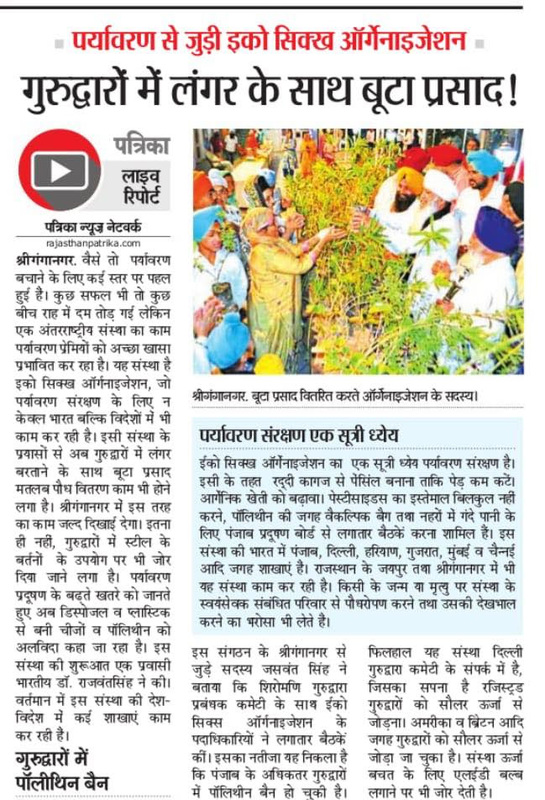 It was an amazing experience to see volunteers from all over Punjab discussing plans to celebrate Guru Nanak’s 550th Gurpurab in a unique way by planting 550 trees at various locations. 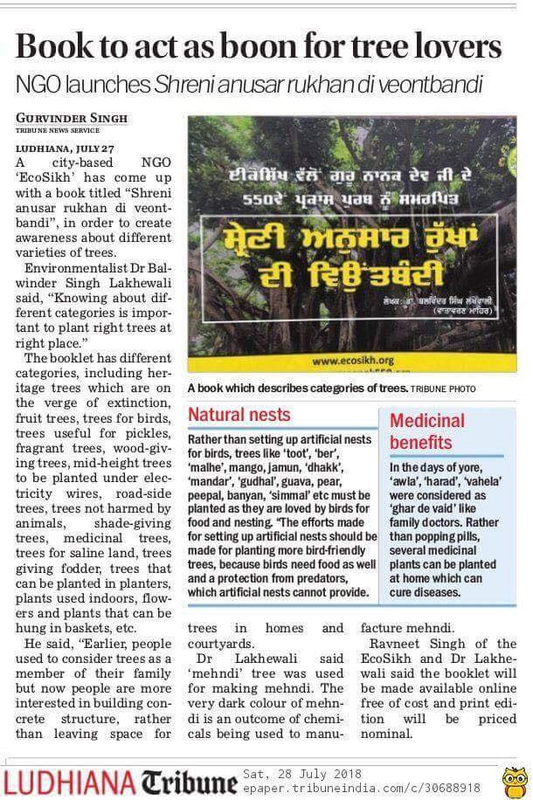 Also, a book by Balwinder Singh Lakhewali (Dr. Balwinder S Lakhewali) got launched that contains all the strategic information about trees and plantation. Support EcoSikh with your generous DONATIONS and help it grow.